With all the talk last week of leaving endless clutter behind for a loved one to deal with when you die, I was inspired to finally make a start on my keepsake clutter. I have been ignoring this task in preference for getting rid of the more obvious clutter that is taking up more space. To be honest I have also been avoiding the tediousness of the task. So I decided to practice what I preach and focus on dealing with a little at a time rather than dwelling on the entirety of the task. This sort of clutter takes up a lot less space than it does time to sort through. Therefore I started on the easiest things first so as to maximised the feeling that I was making good progress thus giving me inspiration to go on with the task. 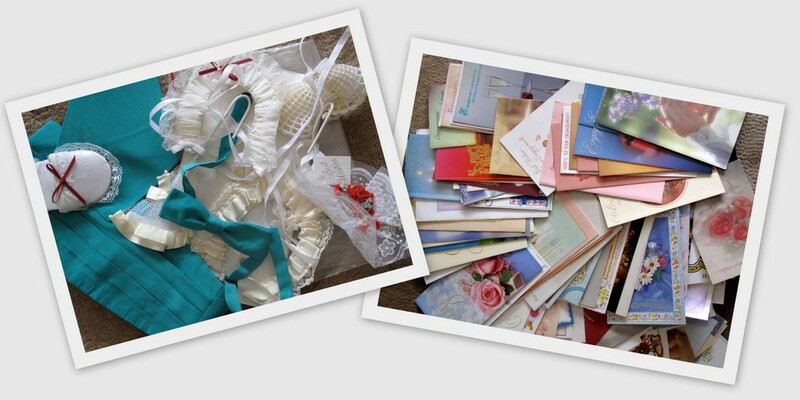 My focus so far has mostly been on greeting card clutter from my wedding and engagement. There was also a few nicknacks and little memorabilia items that I chose to declutter as well. After last weeks cash windfall while going through my son’s cards I thought it wise to look inside each card before putting them aside for recycling. Alas no such luck with the money this week. But I did have a good time seeing who they were all from and reading the occasional funny message. I didn’t even recognise the names in a few of them. As for the wedding cards, I made a list of all the names in the acceptances and inabilities to accept in order to have a record of who attended. Then as I went through the wedding cards I transfered the information about the gift given along side the name on the list. I was amused to read what people had given us and did a mental check off of what of that still exists in my home. The items remaining list was short but I found myself thinking ~ ‘Oh, so and so gave me that, well done, I got really good use out of that or I still have that!’. I have started a keepsake file on my computer to store this information should I ever feel compelled to review it. Most of the stuff I really just had a quick glance at, decided I hadn’t looked at it properly since the day it went into the box and put it aside to recycle. Keepsake is a well constructed word to describe this kind of item, we keep it just for the sake of it. We think we will cherish it forever and look back on it in the future but how far into the future do we go before we ever really care to look at it. My husband and I have been married for 24 years and if it took till now to look in those cards then we don’t really need to keep them. Given the failure rate of marriage, the fact that we are still together after all these years is enough for me and I only care to look forward to another 24 years. I don’t need clutter to remind me how good my life has been and it gets better every day. Part of the process was to divide and conquer. These are the items that were decluttered from the box. The box was empty once I was done while the few items I kept were transfered to another box with will be the subject of further decluttering. That the sun shone brightly today for my son to finally achieve the sun exposure photo project for his final body of work for one of his university photography courses. The weather has not been very cooperative for this entire project so I was grateful that he finally can see the light at the end of the tunnel. This is a really, really, REALLY hard area for me. I trasure all these things but I know I can’t continue to keep piling them up in my house. My stumbling block is this: I am extremely sentimental and I am also the best one in my family about doing family history work and keeping our family heritage alive. So to me things like this fall into the “family legacy” category. How excited would my potential grandchildren be to look through these cards or other mementos that I have saved. I know that I absolutely LOVE to see things like this from my anscestors. Expecially handwritten items. So how do I surpass this feeling?? Or how do I sort through these things the best I can and maybe reduce them a little bit? Do I scan all the various cards and make a three ring binder of them??? What ideas does everyone have? Please help!!!! If everyone in History de-cluttered everything about family etc, there would be no history. It is a matter of how far you are willing to go! I so know where you are coming from, it is hard but I found the best way to handle it was to use a small scrapbook and put a photo with the card or letter so I know who’s writing it was and everyone else does too. Decide what you feel is most important about the card/letter. Choose the most significant card/letter (maybe one that talks of historical things like migrating with the family to some far flung destination, being present at life changing events and such like) I didn’t hang onto anything that wasn’t telling a story. One example is a letter from my Hubby’s Grandma that spoke of him as a boy, her memories of him before his family moved State. Another from his Nanna that described the build-up and then the aftermath of Darwins’ Cyclone Tracey in 1974. That is precious! Maybe you could trim the card and only keep the part that was written with a little side note of who and when. When you make the time to do it you will become practiced at sorting the ‘wheat from the chaff’. Be honest with yourself and then ask your family members if they would like to prepare the book/s with you, that way you all get to have a say about the ‘history’ you are preserving and the ‘history’ you are creating. If you do choose to have the family help ask who will maintain it and keep it going if anything should happen to you. The answer to that question may surprise you! Going Digital is also a very good way to ‘keep’ everything together and it really will come down to how much is manageable and how long do you have to keep updating etc. Then the clincher that helped me sort it out was “The Burning House” imagine losing everything – gone!!! – theft-fire-cyclone-flood! Having experienced theft, fires (bush) and major flooding from burst pipes, (thank God not a rain flood) it really made me be conscious of what I had and what I should be doing with it, so I made little books for the family for them to add anything they want to preserve, copied them and stored the copies on a disk. It’s not foolproof but it helped, so far so good and in the event of my demise or a major catastrophe, there is a copy out there. Start somewhere and go slowly, you will start to see what is really important and keep making the piles, they will get smaller and as you get to the ‘good stuff’ you will be able to handle it with ease and I’m sure you’ll have a book or disk or box (small) of treasures that will be cherished and honoured within your family. I have to cull my clutter a little at a time. I go through an area and get rid of anything I no longer need, use or love. I ask myself what I’m really going to take the time to look at and treasure. If something is really painful to even think about getting rid of, I keep it. If space was an issue I might have to tackle this differently, but since it isn’t I don’t. Each time I go through my things I’m able to detach and get rid of more. Don’t rush or beat yourself up over slow progress, progress is progress. I used to have several shoe boxes worth of keepsake photos and papers, plus two huge scrapbooks, plus a box of extras. In the past year I’ve gone through and tossed everything but one shoebox of photos and one shoebox of letters. When I went back and reread some of the letters, I realized they were too mundane for me to care about reading again. Things I thought I might want to see, but didn’t necessarily need in hard copy I scanned and tossed the original. I’ve found having scans very helpful. It’s made it easier for my family and I to share items, and since I often have my laptop with me, I can look at these things anytime the mood strikes. Raesha, have you thought that maybe your children or grandchildren will not have the same intensity of interest in cards or mementos as you do? (hard to know for grandchildren who aren’t even here yet! but if you have older children you can ask them). I know that I would feel suffocated by a lot of mementos from previous generations. That’s just me, everyone is different. And if you decide to preserve them, I think Dizzy’s advice on how to do it is excellent. Like Jo, I too would feel suffocated with a lot of mementos from previous generations. Everyone is different though and Dizzy had some great ideas on how to preserve your things. You obviously take great pleasure in this hobby so you should do it, just know that others might not have the same feelings about it as you do. Hopefully there will be someone who comes after you to continue your work. Well done, Colleen. I did the wedding box a couple of weeks ago. No money in the cards, but I did find a check that never got deposited. Since it’s 24 years old I just sent it to recycling. I’ve been slowly working my way through pictures and cards/letters. I pick an amount of time and let go of the easy ones. Each time through a few more things are let go. It’s slow but steady progress. And as to your weather…we had a warm sunny day yesterday. But today is cold and rainy. And I just looked outside to see that the rain has turned into snow! Oh dear. I don’t want another winter like last one. But I bet I could get through a lot of stuff if we did! 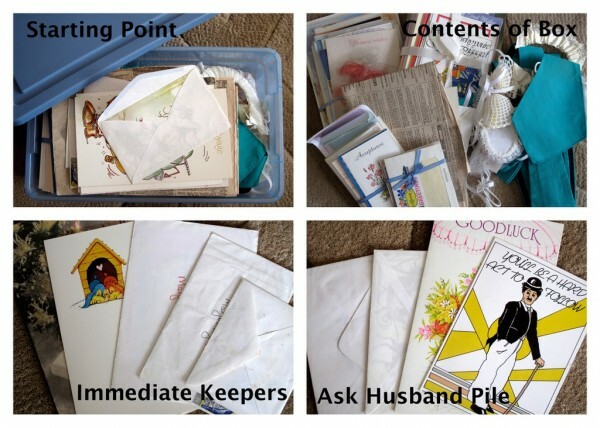 I like your approach to decluttering the keepsakes it is much the same as what my hubby and I have done. I went through them once, the he went through them, then he had another turn and now I am going through them again. We consult with one another whenever we decide to declutter something that is relavent to both of us but anything of our own we just do as we see fit. Good work Colleen – I’m glad you tackled some challenging areas – it’ll only help you help us more! I was curious what the teal things were… I love that colour! I’m starting to channel you now – I photographed my ‘after’ tidied wardrobe (for a week, it had all winter and all summer jammed it. We got the floors sanded and had guests, who could only sit in my room, as I’m lucky to have a few beautiful but uncomfortable chairs in there – and I needed the open suitcase of summer stuff ‘tidies’ and out of floor sanding dusts’ way). Anyhow, I took a woolworth green bag of clothes to charity with the dog walk, and have a pile of winter woolies to wash before storing. Shame it rained last night – but thankfully I didn’t put the washing on yet!! now you are testing my spelling skills ~ The teal things are a bow tie, a pocket kerchief and a cummerbund which were worn with my husbands wedding suit. Well done with the wardrobe declutter/tidy. And what a multi-tasker you are, dropping off stuff at the charity bin and walking the dog at the same time. This is a biggy for me, whilst I don’t have tons of clutter in this area I am reminded how I got very grumpy with my own child just recently. She took her baby ” daddoo ” ( dummy ) for show and tell and the rubber was beginning to perish ( she’s 8 now ) and after playing with the sucker bit, she broke it. I had a face as long as Nigel Mansell’s dipstick about it, but then after reading this post felt a lot better. I feel the need to rush home and get culling again- how many finger paintings should I have saved ???? I still have my son’s glow in the dark dummy and it is having structural integrity problems with the rubber bit as well. Luckily I actually kept the protective cover so even if it does drop off I can keep it together. I have his school paper set aside to go through now and I plan on being far more ruthless than the last go round. Hi Wendy and welcome to 365 Less Things and thank you for stopping by and leaving a comment. I hope you will make a habit of it. I am glad you are finding that you like it here. I have a million photos to go through too and one day I will have to stop avoiding that issue and get on with it. All in good time though. The more ruthlessness I build up in the meantime the more thorough of a job I will do of it. That’s my story and I am sticking to it. 😆 I have actually made a start on this before but I only return to it occasionally to do a little more. One thing at a time and its time will come soon as I must surely be running out of other things to declutter by now. One question I must ask is ~ Will you be giving your children permission to cull the photos further if they wish after you have shared them out between them? I always feel that we should make it clear to the recipients of our stuff that they are under no obligation to keep it. Once again welcome and I hope we can help make your declutter journey a pleasant one. I love the dummy stories, keepsakes are difficult and can become clutter eventually, I have kept some things of my sons including his coming home outfit and booties (little cotton ones and they are so small) I also have his first pr of sturdy leather sandals that crack me up when I vistit the Box and look at them, I remember the Nurse at the Clinic remarking to me that I had better start a bank account up just for shoes coz my son is gonna need new ones often. Omg she was so right. He plows through shoes so quickly and I think maybe I’ll buy string and just attach planks to him hahahaha!! Ooo…I have the same foot size as your daughter. I buy my shoes in the girls dept. Not much of a selection for an adult. I just won’t buy pink, sparkly shoes! It does keep shoe clutter under control for me. If you lived in Brisbane, Australia you could go to Dragonberry Stride & my daughter could hook you up with some great shoes I bet. But with a self inflicted shoe shopping ban and natural progression … who knows, I might be there once the decluttering comes full circle. Keepsake clutter. I love this one. During our marriage, we have moved many times. Each move gives an opportunity to get rid of clutter. I have v e r y little keepsake clutter these days. The cards ( all ) have been thrown away long ago. The same applies to many things, that bring only sad memories. My grownup daughters have picked, what they have wished to have ( the younger one is a minimalist by nature ). My husband has not shown much interest in memory-stuff, so I have had free hands to do as I please. And I have been pleased to declutter. It has been a great relief for me to read ( from somewhere ), that once you have accepted a gift, it is your´s, and you may do whatever you want to do with it. Amen. However. The photographs. I am somewhere ? with the ones of my own family. I have moved a lot myself but the keepsakes were never considered for decluttering but this time it is a different kind of declutter. This time it is for good. No more bring stuff in that won’t get used and slowly but surely deleting everything that isn’t beautiful, useful or extremely sentimental. And if I had more way like you there would be a lot less sentimental stuff around her as well. It turns out I am not the sentimental one, go figure. And I will get to those photos again one day too. reading through these comments made me realise that my family have a trunk full of photo’s of our trip to Autralia, which was 10 years ago! I’m off sick from work today so I might actually need to check those out and see what I still remember. Time to make books and throw away the photo’s i no langer recall…. Now, lets see where they left the lot. Hi hunter_xs, your comment reminds me of the million photos my husband has of his trip to China from before we were married. Boring!! Even the kids would like to see them disappear. The million might be a slight exaggeration. Colleen, I like your thought about how we “keep” stuff just for the “sake” of it. I never looked at the word like that before, but it’s true. It really is true. I am glad to say that there have been a lot of things that have been kept for the sake of it going in the recycling at my house this week. And the task wasn’t nearly as tedious as I thought it was going to be. Yay me! thanks for the cheering and the title of master declutterer (that may be an exaggeration but thanks anyway)I love the point you make also that the dreaded tasks can turn out to be easier than we think. It is so true, the whole task to declutter our homes is often not as scary as we blow it up to in our minds. I cut up the cards into small gift bag tags (with a hole punched) I can use in a pinch…I don’t have to purchase a card and the tag is extra special. Keep them in a small zipper Baggie.